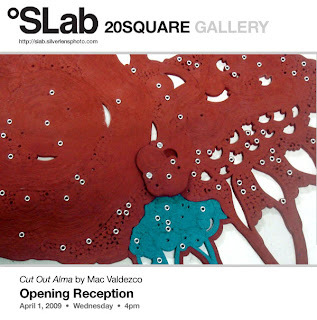 SLab is proud to present Cut Out Atma, new work by Mac Valdezco, opening at 20SQUARE gallery at 4pm on April 1, Wednesday. Valdezco’s show of wall-bound sculptural pieces of solidified cotton tape and aluminum screws continues the artist’s exploration of the representation of living forms. Cut Out Atma is the product of the artist’s fantasy. Two pieces, in shades of terra cotta and turquoise mimic cross sections of tree trunks. The process of laying down her synthetically solidified cotton tape in concentric rings as metaphor of scarring, aging, and growth. A third piece, a white bubbly wall of circles in different sizes on a black canvas – bubbles on ascent from the deep black or the relationship between oil and water? Valdezco’s Cut Out Atma is rich in dialogue between material and metaphor, marking the transition from static object to living form. Mac Valdezco (b. 1976) graduated with a degree in Fine Arts from the Technological University of the Philippines in 1997. She has exhibited in the National Museum, Vargas Museum, Ateneo Art Gallery, Avellana Gallery, Blanc Art Space, Boston Gallery, and the Cultural Center of the Philippines, among others. Valdezco was given the Cultural Center of the Philippines’s 13 Artists Award in 2006 and has been shortlsted for the Ateneo Art Awards three times. Cut Out Atma by Mac Valdezco runs from April 1 to 25, 2009 at 20Square Gallery. Accompanying the show is between the sea and the sky by Christina Dy at the SLab Main Gallery. Visit 20Square at 2/F YMC Bldg.II, 2320 Pasong Tamo Extension, Makati City. Gallery hours are from 10am - 7pm Monday to Friday, and 1 - 6pm on Saturday. For more information, call 8160044 / 09052650873, email manage@silverlensphoto.com or visit slab.silverlensphoto.com.